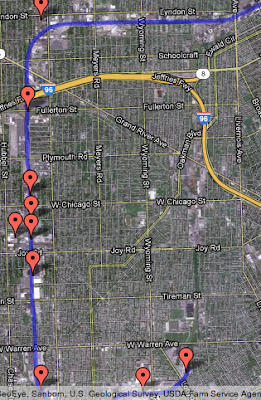 The Conrail Union Branch represents the new West End of my modern day, proto-freelanced Detroit Terminal Railroad. On the map to the left, the Union Branch starts just north of Dearborn, slightly west of the Dearborn Industrial Track, which I covered in the last post. The Union Branch runs due north before turning 90 degrees due east and, in the real world, terminates a few miles later. 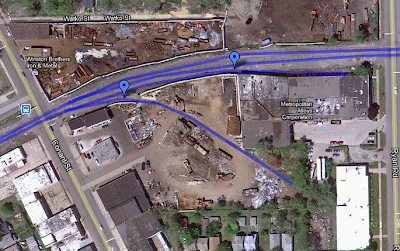 Conrail Union Branch jobs originate from Livernois Yard, just out of the picture to the south, and use the CSX Detroit Subdivision to access the Union Branch (just like the Dearborn Industrial Track). Taking a closer look, satellite imagery shows the Union Branch travels along a corridor of industrial and commercial development on Detroit's west side. There is an at-grade crossing with the Canadian National just south of I-96, but otherwise the action is purely industrial switching. 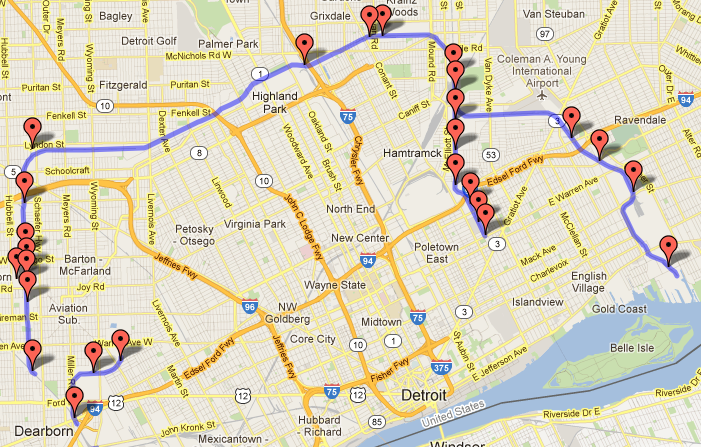 On this map, you may be able to make out the route of the now-abandoned west end of the original Detroit Terminal. 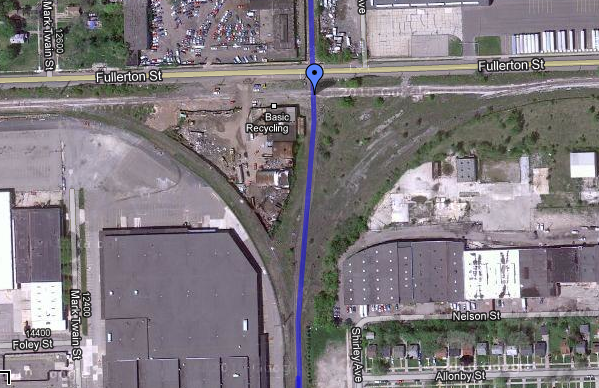 From the end of the Dearborn Industrial Track near the bottom right corner of this image, the right of way continues due north through another industrial area that starts at Joy Rd. 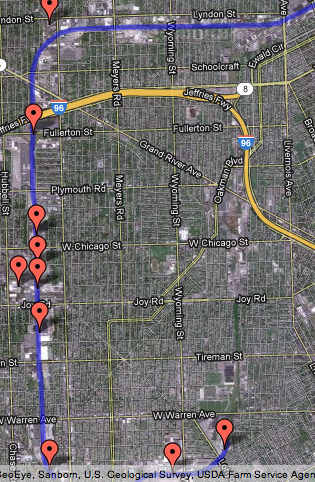 The right-of-way continued north until Schoolcraft Road, where it curved to the northeast. 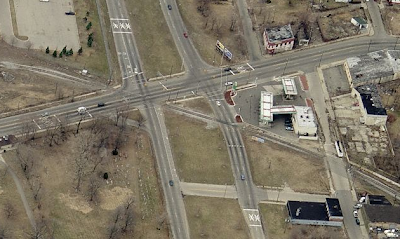 Near Lyndon and Livernois, the DTRR crossed and then interchanged with what is now the Conrail Union Branch. In the heyday of the DTRR, the Union Branch was owned by the Pennsylvania Railroad and was a competitor to the DTRR. Starting at the southern end and working our way north, here is P Company Junction. This is the switch off the CSX Detroit Subdivision that provides access to the Union Branch. That rusty old signal bridge is a neat detail. The first industry, just off the CSX mainline, is Hollingsworth Logistics. It's basically a big warehouse, and the main structure isn't rail served. The only thing I'm interested in is the small building surrounded by semi trailers. I've rotated the view in this image to show the rail door and the truck docks. If I'm honest, I haven't the foggiest idea what goes on here, but I'd be willing to bet it involves transloading from railcar to trucks. While I'm out here on a limb, I'll jump up and down a bit and say it could be produce. According to Hollingsworth's website, it is a certified Native American company. Otherwise, despite the lengthy text, I couldn't tell you what they actually do! Just north of Tireman Street is this group of warehouses. All of the rail spurs look dilapidated and out of use. However, as Lance Mindheim has noted, such things can quickly change. 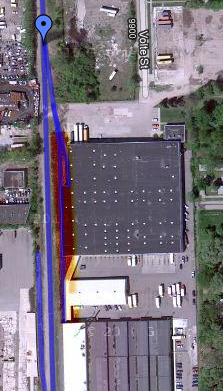 The trackage to these warehouses is fairly interesting, and could make for some interesting operations. Continuing north, we cross Joy Road and immediately come to a passing siding and two spurs serving chemical plants. The first spur curves to the west and splits into two sidings serving PVS Nolwood. This plant produces a variety of chemicals for companies like Dow Chemical. 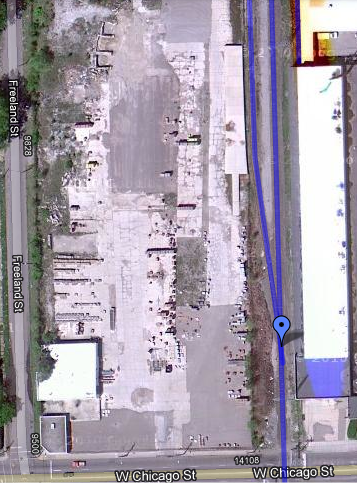 Both Google and Bing maps show mostly tank cars spotted here, but there are some hoppers too. The second spur parallels the mainline and serves Houghton International, which specializes in industrial lubricants. Tank cars are the only traffic here. 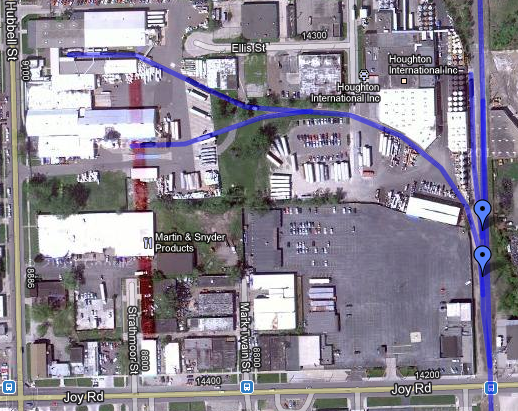 JSP International is just north of the two chemical plants, and is a plastics manufacturing company. They serve a number of industries including the automotive industry, which is the likely reason for this plant's existence in Detroit. Rail traffic appears to be exclusively cylindrical hoppers. 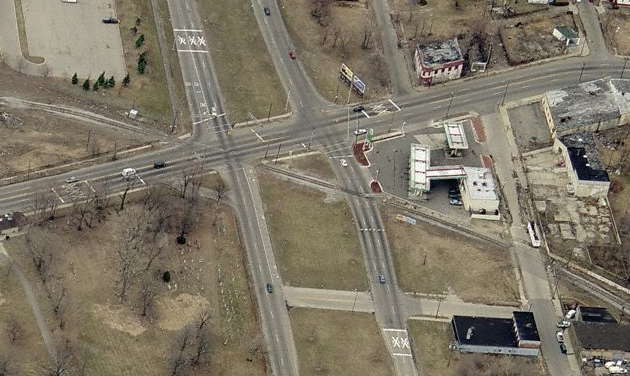 Best Block is just north of West Chicago Street, and has a single spur serving a simple concrete platform. 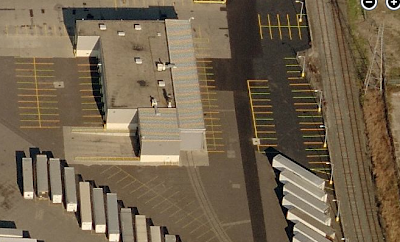 Best is a masonry and landscape block supplier, and Bing maps shows product delivered by 50' boxcars. Modeling Best Block would be simplicity itself, since the industry is basically just a flat lot with a concrete platform and stacks of blocks laying about. J. Lewis Cooper is served by a facing-point spur that slightly overlaps the Best Block spur. It is a wholesale distributor of wine and spirits, and this structure appears to be a warehouse and transloading facility. There are actually two spurs serving this industry. The first goes into the J. Lewis Cooper warehouse through a roll-up door, while the other continues alongside the warehouse building. This second spur appears to have once served the warehouse just to the south, but now the rails peter out in the weeds. This track could be used to spot extra cars or for storage. Further north across Plymouth road is a small three-track yard. It runs alongside a Chrysler truck plant which, though it is not currently rail-served, may have been at one time. 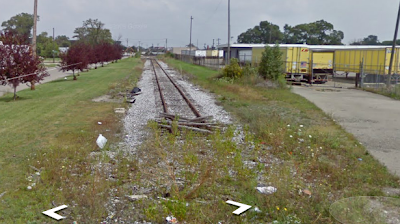 This small yard would be a good place for a locomotive to run around its train in order to switch J. Lewis Cooper. 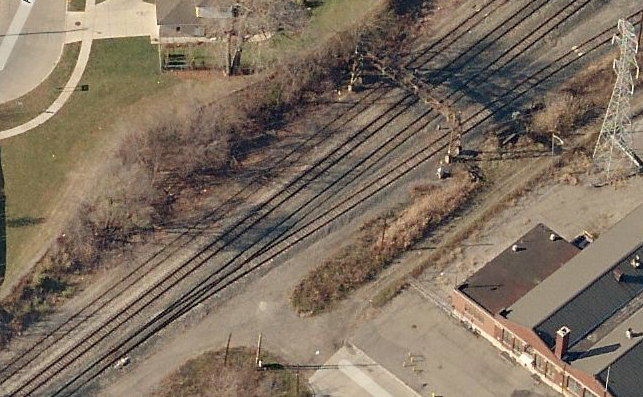 The primary purpose of this yard, however, used to be interchange with the CSX (formerly Chessie Sytem/Pere Marquette/etc.) More on that in just a moment. 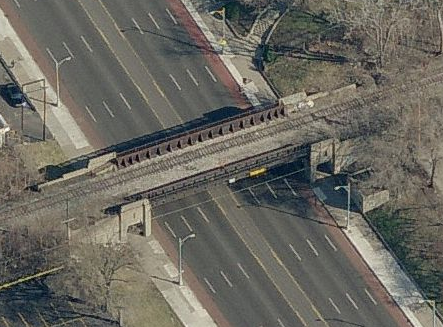 The interesting detail in the following Bing maps image is the Conrail caboose. Though I'm not sure when the image was actually taken, it seems likely this was long after cabooses were all but extinct! 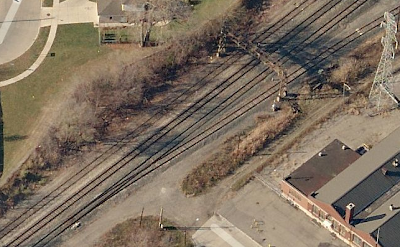 Pictured to the left is the crossing with CSX, and you can clearly see the vestiges of a wye to permit interchange. Both legs of the wye are gone now, and the space inside the western side of the wye is now occupied by Basic Recycling. 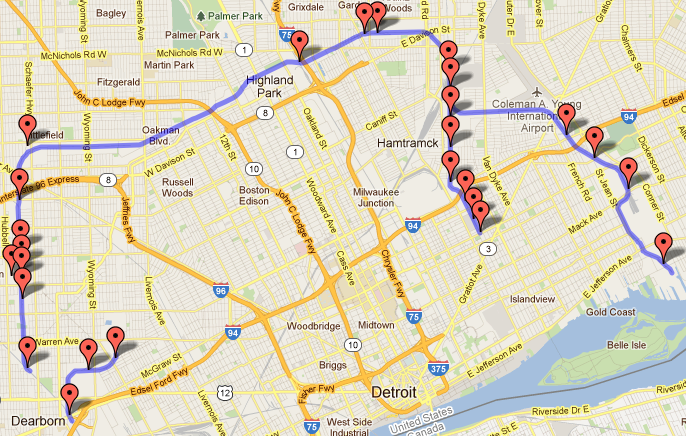 Though not rail served, it has a lot of Detroit character and would make interesting modeling. 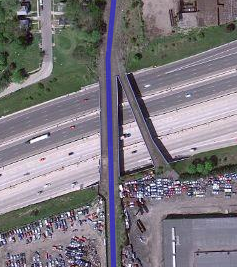 Next, the DTRR crosses I-96 on an overpass. There's not much to see here except 14 lanes of traffic and a secondary bridge that once carried a spur to a large warehouse on Fullerton St. This wouldn't be a priority to model, but if there was space, it would give the model a sense of place, cementing the location for Detroiters. The DTRR continues uneventfully for several miles north of I-96, until the right-of-way begins to curve eastward. Along this curve, a spur diverges northward to serve West Friendship Materials. 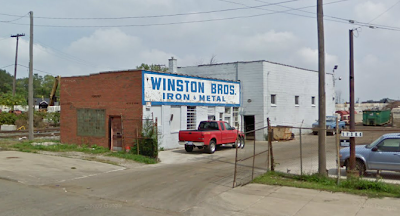 This business, similar to Best Block to the south, is typical Detroit. Since no big corporate stores are willing to risk investment within the city limits, old-fashioned, Mom & Pop style local businesses flourish to fill the need. As you will see in the image below from Bing maps, building materials are delivered in 50' boxcars, spotted at various places along the spur. While the spur strays relatively far from the mainline, this industry naturally lends itself to filling empty space in a corner of the layout. With the help of some selective compression, it could work very well. For me, this scene is a priority to include in my DTRR model. Here's the image from Bing maps, and you'll notice two boxcars - one in the bottom left corner, and another spotted at the curved building just to the left and above all the trucks. After this, the tracks continue east to Wyoming Ave. where they currently terminate. 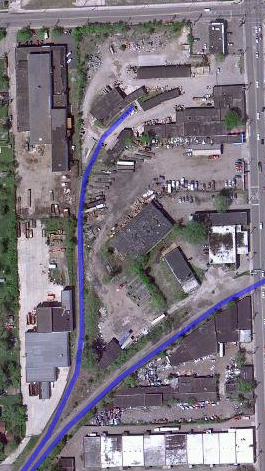 Before this portion of the line was abandoned, it continued east to Livernois Ave., where the old Pennsy Union Railroad crossed the original DTRR and interchanged with it. Though I'm trying my best to avoid stretching the bounds of reality too far, I find the Wayne Bolt & Nut building that sits just north of this junction too tempting to resist. This place personifies Detroit for me. Clearly built during the "good old days" of the Detroit auto industry and likely supplying all of the auto factories in town, the business is still alive despite the near collapse of the industry on which it depends. Yes, the paint is chipped, the weeds are overgrown and the roof is sagging. So what. These are badges of honor, signs that the folks in charge put a higher priority on finding business to stay alive and keep the employees working. 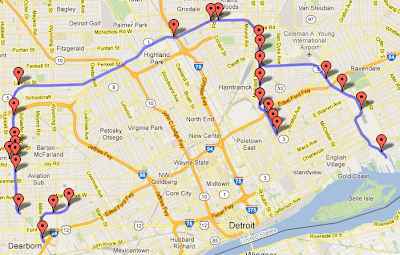 In my next post, I'll continue moving clockwise around the theoretical modern-day Detroit Terminal Railroad and consider the Highland Park Industrial Track. Included along this right-of-way is the spot where the old DTRR Davison Street Yard once stood, the main yard and nerve center of the old railroad. Therefore, this will also mark the transition from the West End to the East End of the DTRR.